Collection of articles on problems of lingohistory, revival and development of the Tatar nation. 1. Modern official historical science about ethnic roots of the Tatar people. 2. The historians about Scythians and Sarmatians. 3. What is the basis for Scytho-Iranian theory? 4. What the Scytho-Türkic etymology tells? 5. A general view of the historians on ancient Türks. 6. Which ancient peoples of Eurasia were Türkic speaking? 7. Ethnic components and ethnolinguistic continuity of development of the Tatar people in the Middle Volga and Urals. A popular belief of historians is that before the Great Resettlement Of The Peoples the Iranian-speaking tribes basically populated the Eastern Europe, Western Siberia, Kazakhstan, Middle East, partly the Central Asia, and also Near East. Such opinion is based on the premise that described by the Greek historians Scythians, who lived in these regions in the 9-3 cc. BC, and also the Sarmatians, who in the 3 c. BC replaced the Scythians and lived until the 3 c. AD, were supposedly only Iranian-speaking. Indo-European linguists came to such conclusion based on exclusively Indo-Iranian etymology of Scythian and Sarmatian words given in the sources, persistently without considering other languages in these linguistic operations, especially Türkic languages. In the unstoppable desire ‘to prove’ the Iranian linguality of these populations these scientists completely dismissed those researches done before them, in which Scythians and Sarmatians were recognized to be basically Türkic speaking. As to the region of Volga and Urals, here again lived Scythians and Sarmatians, but near the Finno-Ugrian tribes, who basically were occupying a woodland zone. Therefore the archeological cultures of this region related to the period before the ‘arrival’ here of Huns in the 4 c. are recognized as Iranian, and some as Finno-Ugrian [Khalikov A.H., 1969, 3, 373]. The Türkic archeological cultures, naturally, are not found, for, before the arrival of Huns in Eastern Europe, there were no Türks at all. The (Russian - Translator’s note) official historical science holds on to a disputed question about the time of the so-called Türkization of the Middle Volga and Urals. Some state that the first Türks penetrated this region as Huns after their arrival in Eastern Europe in the middle of the 4th c. Other scientists hold to the opinion that Türkization of the Middle Volga and Urals took place presumably only in the 8 c. in connection with the arrival here of the first Bulgars from the collapsed country of Great Bulgaria of Northern Caucasus and Northern littoral of the Black Sea. There are also differing opinions about the continuity between the Bulgars and Tatars. Some, mostly Tatar scientists, believe that Bulgars spoke a common Türkic language and were a language-bearing component of the Tatars. The others believe that Volga Bulgars spoke not a common Türkic, but a Chuvash-like language and that their arrival formed only the Chuvash people, and as to the Tatar people, they officially formed mostly from those Tatars who came to the Volga and Urals together with the Mongolian armies in the beginning of the 13 c., and naturally, subsequently were absorbed as part of the Chuvash speaking Bulgars and the local Finno-Ugrians. This view limits the roots of the Tatars in the Volga and Urals region to the 13 th century. We cannot miss to also note the presence of such scientists, who, based on superficial study of Bulgar epigraphy are asserting that a part of Bulgars, under the influence of Kipchaks, separated from Chuvash-speaking Bulgars only in the middle of the 14 c. and thus started the formation of the Tatar people. There are even such scientists, who connect the formation of Tatar people with the arrival and fertility of Kipchaks after a plaque decimated Bulgars in the middle of the 14 c. The Bulgaro-Chuvash words allegedly disappeared from the Bulgar epigraphy after the mass extinction of Bulgars in the middle of the 14 c.
The study of the beginning and the process of formation of the Tatar people or its language-carrying components are further complicated by some scientists trying to place the so-called Magna Hungaria (Great Hungary) in the Middle Volga and Urals. It is known that Arabian and Persian travelers of the 9 - 10 c. wrote about Magyars (Madjars, Majgars etc.) in the descriptions of Middle Volga and always noted that Madjars speak Türkic language. In spite of the fact that Volga Madjars unequivocally were Türkic speaking, some scientists of the 19 and 20 c., based on the equivalency of the Türkic ethnonym Madjar (variants: Majgar, Mojar, Mishar, Mochar) with the Hungarian self-name Magyar, associated them with Hungarian speaking Magyars and begun to assert that on the Middle Volga and Urals in the 4-8 c. lived Hungarians who formed ‘Great Hungary’ [Erdeyi I., 1961, 307-320]. The supporters of this point of view came to a conclusion that Türkic-speaking Mishars and Bashkirs were formed by a Türkization of those Hungarians who remained in our region after their main part left to the West in the 8 c.
The theory of the Hungarians on the Middle Volga and Urals is fouled by the fact that neither in Tatar, nor in Bashkir languages there are any Hungarian borrowings. It would be possible to explain it by a late arrival of the Türkic-speaking ancestors of Tatars and Bashkirs, only after the Hungarians already left to the West at the turn of the 8-9 centuries.. But then how to explain the complete absence of Hungarian toponymy in the study region? Our opinion is that the Hungarians did not live in the Middle Volga and Urals regions, and that there was no ‘Magna Hungary’ there. Hence, the Eastern travelers, who with one voce all pointed to Madjars as Türkic-speaking, were writing about Türkic speaking Mishars, instead of Hungarian-speaking Magyars. Therefore the travel notes of the Arabian and Persian travelers do not provide a basis for the existence of the Hungarians in the Middle Volga and Urals region. Observing the similarity between the Bolshie Tigany and Kushnarenkovo burials with the sepulchers in Hungary, it would be possible to explain that the sepulchers in Hungary belong to the Türkic people, who were somehow connected with Türks of our region. 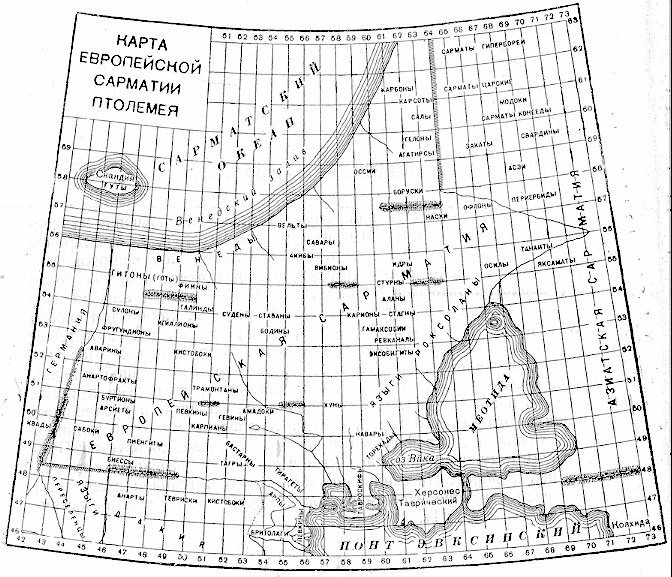 So in the (Russian - Translator’s note) official historical science, which arose and developed only based on the Indo-Europeanism, there is no uniform opinion until today on the beginning of the formation in the Volga and Urals region of the basic, language bearing component of the Tatar people. § 2. The historians about Scythians and Sarmatians. In modern (Russian - Translator’s note) official historical science the Scythians and Sarmatians are recognized as Iranian-lingual (in particular, Ossetian speaking), but in the historiography of this problem we also meet other points of view. In the second half of the 18 c. the Russian scientists began to be interested in the Greek historical sources. At first from German, then directly from Greek to Russian is translated Herodotus ‘History’, which attracts the attention of the Russian historian Andrey Lyzlov, who knew well Russian and Western historical works. He was also familiar with Türkic world, for he translated to Russian the work of S. Starovolsky ‘Court of Türkish Caesar’, published in 1649 in Polish in Krakow. In 1692 Andrey Lyzlov finished a manuscript ‘Scythian history’. This work was published by a renowned public figure and a writer N.I.Novikov, partially at first in 1776, and then completely in 1787. In his work A.Lyzlov in the beginning proves his thesis that Türks (in his terminology: Tatars and Türks) descend from Scythians. In the subsequent sections of ‘Scythian history’ the author tells a history of mutual relations of the European peoples and Russians with Tatars and Türks, i.e. descendants of Scythians [Lyzlov A., 1787]. The historiographer of Herodotus ‘History’ A.A.Neukhardt from this deducted that “the name ‘Scythian history’ thus has appeared rather conditional” [Neukhardt A.A., 1982, 9]. The other expert on Scythians, S.A.Semenov-Zuser considers the work of A.Lyzlov ‘as the first composition, known to us, in the domestic literature’ [Semenov-Zuser S.A.,]. In the beginning of the 18 c. the interest to Scythians grows. At the request of Peter I, who was interested in the problems of an origin of the Slavs, the Viennese scientist G.W. Leibniz begins to study strenuously the history of the Slavs and in one of the letters in 1708 he writes: ‘Under Sarmatians I mean all Slavic tribes, which ancient named Sarmatians, before a name of Slavens or Slavs was known’ [Leibniz G.W., 1873, 211]. The Russian historian of 18 c. V.N.Tatischev considers the word Scythian as a collective name. He writes: ‘... The name Scythian covered many different peoples, as Slavs, Sarmatians and Türks, Mongals, or all North-Eastern- end of Asia and Europe, including Germans, Persians and Chinese, and this name, evidently, died away at about 10-th hundred after the Christ, when the awareness about peoples began to be more distinct: however, those peoples did not disappear, but have remained somewhere under other names till today... in third on tenth century after the Christ for the Europeans the name Tatars has become famous, and these both instead of Scythians began to be used’ [Tatischev V.N., 1962, 232-233]. In the 19 c., archeological excavations give scientists an opportunity to prove that Herodotus and others Old Greek historians reflected adequately the history of the Eurasian peoples. Were published translations of the works of other Greek historians to Russian. Were created conditions for a wide study of the ancient history of the land. In 1838 the academician E.I.Eichwald, who earlier worked in Kazan and Vilnius universities, performs research of Herodotus ‘History’ and, based on it, he tries to reconstruct the history of the Slavs, Finns, Türks, and Mongols. He comes to a conclusion that the Scythians were not a uniform people, and the name Scythians meant those peoples who live now on the so-called Scythian territories [Eichwald E.I., 1838, Vol. 27]. In the first half of the 19 c. the German historian B.G.Niebuhr views Scythians as Mongols, this then included Türks [Niebuhr B.G., 1847]. In a work published in 1837 in Munich, K.Zeuss began a new stage in the study of Scythian history. For the first time he begins to identify Scythians with Iranian-lingual tribes. In favor of this opinion speak, in his opinion, the religion, territory of Iranians, and the common Scythian and Persian words. [Dovatur A.I., 1982, 47]. In 1855 another German scientist K.Neumann, coming from the same religious and linguistic considerations, asserts that Scythians were Türks, and Sarmatians were Slavs [Ibis, p.50]. P.I.Shafarik considers the Scythians as Mongols, who then included Türks; the Sarmatians as Persians, the Budins and Nevres as Slavs [Shafarik P.I., 1948; Dovatur A.I., 1982, 48]. In the 60-es of the 19-th c. K.Müllenhoff analyses from the point of view of Indo-European languages the Scythian and Sarmatian words and comes to a conclusion that Scythians were basically Iranian-lingual, that Iranian-lingual tribes earlier lived far to the north of Iran, and from them descended today’s Ossetians. [Dovatur A.I., 1982, 53]. After K.Müllenhoff the Scytho-Iranian theory attracts many linguists and historians, who found additional materials in its favor. The theory became attractive, apparently, because it allowed expanding an ancestral home of Indo-European peoples. A distinctive feature of scientists of this orientation was their unity against dissidents, they aggressively criticized dissidents, even discounted them as not competent, insignificant scientists. But, despite of it, at all times there were scientists who criticized the Scytho-Iranian theory and were proving the Slav, Türkic, Mongol or Finno-Ugrian linguality of Scythians. The noted expert on Scythian history L.A.Yelnitskiy, on the basis of the comprehensive analysis of historical works and factual materials, comes to a conclusion that the vestiges of Scythian culture for a long time and persistently languished in the cultures of Türko-Mongolian (and in a smaller degree in Slavic and Finno-Ugrian) peoples [Yelnitskiy L.A., 1977, 243]. Archeological materials, especially the so-called animal style art, also neither confirm nor deny the affinity of Scythian and Türko -Mongolian cultures. As to the religious attributes, it is possible to state the following: if Scythians were Iranian-lingual, they would have had a common deity with Persians, and would not be fighting them as long and persistently as described by Herodotus. Further we shall see, that the names of the Scythian gods can be explained based on the Türkic language. Hence, the Scytho-Iranian theory cannot be with certainty based on ethnographic, religious - mythological and archeological materials. The (Russian - Translator’s note) official historical science surmises that it is based on linguistic data, which has a decisive significance for the interpretation of ethnic ancestry of ancient tribes. Emergence of the Scytho-Iranian theory begins with ‘finding’ of the Iranian roots in Cimmerian, Scythian and Sarmatian words preserved in various sources. K.Müllenhoff begins this etymological research, and Vs.Miller and M.Fasmer continue it. After them the Scytho-Iranian theory for (Russian - Translator’s note) official historical science becomes axiomatic. In the Soviet time, V.I.Abaev was working persistently and purposefully on Scythian etymology from the point of view of the Ossetian language, and he invented a distinct Scythian or Scytho-Sarmatian language in the Indo-European language group. In his work, ‘Dictionary of Scythian Words’ are 353 Scythian words found in the sources, which by phonetical transformations are converted into Old Ossetian lexical units [Abaev V.I., 1949, 151-195]. Before the analysis of Abaevan etymologies, let’s address the V.I.Abaev’s statement about the value of his studies: ‘I subjected to an analysis the undoubtedly Iranian elements and I hope that this ends the light-weighted and irresponsible speculations on Scythian material which do not have anything common with a science ‘ [Ibis, 148]. When a scientist plunges on potential opponents with such zeal, it already tells about the weakness of his position. The Abaev’s etymologies in reality suffer an unsystematic character and many semantic disconnects. From the positions of Türkic language the word Targitai consists from targy or taryg - Old Türkic ‘farmer’ and soy~toy - Türk. - ‘clan’; as a whole it is ‘Clan or Ancestor of the Farmers’. Besides, the name Targitai is met not only in Herodotus, it also appears with Avars as a Türkic name. Theophilact Simocatta (the historian of the 7 c.) informs, ‘Targitiy is an outstanding man in the Avar tribe’ [Simocatta Th., 1957, 35]. Menandr the Byzantian informs that in 568 the Avar leader Bayan has sent Targitai to Baselius requesting a concession [Byzantian Historians, 1861, 392]. In 565 Avars sent the same Targitai as an ambassador to Byzantium [Ibis, 418]. In the 2 c. Polien informs that Scythians, living at Meotian (Azov) Sea, had a famous woman named Tirgatao [Latyshev S.V., 1893, 567]. Hence, these Scythians were also Türkic speaking. Let us compare it with the Türkic etymology. Türk. soi ‘clan, family, relatives, ancestors, generation, offspring, stock, origin’; ak ‘white, noble, rich’; aksoi ‘ a noble, rich clan; sacred clan, forefather’ etc. For Türkic peoples the names with an element soi is a usual phenomenon: Aksoi, Paksoi, Koksoi. The first part is lip~lipo~lep is ‘border’. As a whole, Lipoksai ‘Sacred Clan with (or Protecting) Borders, i.e. its Country’. Let us compare it with the Türkic etymology. We already know about the second part: aksoy ‘a sacred clan, noble clan’. The first part - arpa ‘ barley, grain, product ‘; arpalyk ‘possession of land’; Arpaksai ‘Head of a Clan Possessing Land, Territory, or Clan of the Farmers’. Kolaksai is a younger son of Targitai. Per Fasmer and Abaev, the second part ksaia ‘shine, sparkle, dominate’, in Ossetian khsart ‘valour’, khsin ‘princess’, khsed ‘dawn’ etc. ; the first part is not clear, maybe, it is a distortion instead of Khoraksais, compare Old. Iran. khvar-khshaita ‘sun’ [Abaev V.I., 1949, 189]. The supporters of the Scytho-Iranian theory sometimes lead this name to the phonetic form of Persian Skolakhshaia and announce Kolaksai as a king of the Persian clan Skol (Skolot) ~ Scythians [Dovatur A.I., 1982, 207-208]. Let us compare it with the Türkic etymology. The second part of a word Kolaksai - aksai ‘a noble, sacred clan’; the first part - kola-kala ‘city, capital’; Kolaksai ‘Noble, Sacred Clan Of a (Protecting) Capital, Country’. Let us consider the system in the Türkic etymology of the names of the father and his three sons. Targitai ‘Farmers Clan Noble Ancestor’, Lipoksai ‘Border Protecting Noble Clan’, Arpoksai ‘Protecting Possession Noble Clan’; Kolaksai ‘Protecting Capital (i.e. Kingdom) Noble Clan’. The last, the younger son, as relayed by Herodotus, accepts the kingdom from his father after he brought home the golden tools fallen from the sky: the plough, yoke, hatchet, and cup [Herodotus, 1972, IV, 5]. Another word, the etymology of which serves as a proof of correctness for the Scytho-Iranian theory, is ethnonym Sak~Saka. As the ethnonym used by Persians for Scythians, it is considered to be a Persian word. But at the same time Persians could take it from the non-Iranian Scythians themselves. In the opinion of Abaev, Old Persian saka (with the meaning of Scyth) belongs to the totem of deer [Abaev V.I., 1949, 179]. Ossetian sag ‘deer’ from saka ‘branch, limb, deer horn, antler’. Many historians think that sak is a name of one of Scythian tribes, accepted by Persians as an ethnonym for all Scythians. None of the ancient authors notes the meaning of the ethnonym sak~saka in the sense ‘deer’, and Stephan Byzantian informs, ‘Saka are the people, so are named Scythians of ‘armor’ because they invented it’ [Latyshev V.V., 1893, Vol. 1, Issue 1, 265]. Here the word Saka approaches Türkic sak~sagy ‘protection, guard, cautious’. Besides, it should be noted that in Türk. sagdak ‘quiver’, i.e. ‘case for weapon of defense’. Sagai - ethnonym of Türkic people between Altai and Yenisei, part of Khakass people, Saka - ethnonym of the Yakuts. Thus, sagai~saka~sak is a Türkic word, which has passed into the ethnonym of one of Scyth tribes, and was accepted by Persians as their common ethnonym. Ababa (Hababa) is the name of the mother of the Roman emperor Maximin, she was, apparently, an Alanian. Thinking that Alans are Iranian-lingual, Abaev etymologies this word thus: Iran. khi ‘good, kind’; vab ‘to weave’; thus, Khivaba ‘Good Weaver’. In Türkic ab ‘hunt’, eb~ev ‘home’, aba ‘father, mother, sister’, Ababa ‘Mother Of Hunt or Mother Of House’, i.e. ‘Fairy’ in a good sense. Sagadar, per Abaev: saka- + - dar ‘having deers’ is the name of a tribe near Danube [Abaev V.I., 1949, 179]. In Türkic: saga - Türkic ethnonym, -dar-lar is the plural affix; Sagadar is ‘Sags’. To prove the certainty of Ossetian speaking Scythians, Vs. Miller counted that in Scythian words the Ossetian plural affix -ma is repeated twenty times [Miller Vs. 1886, 281-282]. A more attentive analysis shows that -ma in words given by Miller may be identified with Türkic affixes of plural -ma (-la in Balkarian), or possession -my (-dy-ly), or similarity -mai. So, all the Scythian words assembled by V.I.Abaev in his ‘Dictionary of Scythian words’ would be possible to re-etymologize with those languages, whose carriers lived and continue to live in the so-called Scythian regions. Rather, it is necessary to do it, and with the subsequent comparison of the results of the Iranian, Türkic, Slavic and Finno-Ugrian etymological studies. Only on completion of this operation it would be possible to definitely tell what ethnoses lived under the common names of first Cimmerians, and then Scythians, Sarmatians, Alans-Ases. As the given here comparisons of the Iranian etymology with the Türkic show, the Scythians most likely were not Iranians, or among them were very few Iranian-lingual; basically they were Türks, it could be expected, and Slavs, and Finno-Ugrians, for the last also have not fell from the sky, and have lived in their (ancient ‘Scythian’) regions from the most ancient times. § 4. What the Scytho-Türkic etymology tells? Because the Scythian etymology of Herodotus from the point of view of the Iranian languages does not prove to be true, until now he is considered to be a frivolous linguist, even though he is recognized as an outstanding historian and ethnographer [Borukhovich V.T., 1972, 482, 493]. There are no doubts that if Herodotus etymologies were subjected to research from the polyethnical point of view of the Scythian tribes, the scientific conscientiousness of Herodotus and the soundness of his linguistic descriptions of the Scythian peoples will prove to be true. Now consider some Herodotus etymology of the Scythian words, which do not find confirmation in the Iranian languages. For example, Herodotus informs that Scythians call Amazons by the name eorpata, which in Hellenic means ‘husband killers’: Scythian eor means ‘husband’, and pata means ‘to kill’ [Herodotus, 1972, IV, 110]. Here is observed a rather transparent Türkic etymology: eor~ir~er ‘husband’, pata~eata~wata ‘breaks, beats, kills ‘. As a whole, eorpata in this sense coincides with Türkic ervata ‘kills husband’. Herodotus informs that Scythian word enarei means ‘womanlike man’ [Ibis, IV, 67]. And the Greek doctor Hippocrates (5 c. BC) explains, that ‘between Scythians there are many eunuchs, they are engaged in female works and speak like women; such men are called enarei’ [Latyshev V.V., 1893, 63]. V.I.Abaev gives this word an Iranian etymology: Iran. a ‘not, without’, nar ‘man’, and a-nar-ia ‘not a man, halfman’ [Abaev V.I., 1949]. This word almost coincides with Türkish ineir-anair, that is translated, as in Herodotus, ‘womanlike man’. Per Herodotus, the Scythian word arimaspi means ‘one eyed people’. Scythian arima ‘one’, and spu ‘eye’ [Herodotus, 1972, IV, 27]. Assuming that one eyed people meant half closed eyes, then arima can be determined as Türkic iarym ‘half, semi’, and spu~sepi’ slightly open eye’. Thus, Scythian arimaspi and Türkic iarymsepi ‘half blind, half open, half sighted’ almost coincide. Herodotus connects the city Kizik with festival [Herodotus, IV, 76]. This city, located on the Asian coast of the Sea of Marmora, later began to be called Tamashalyk, which means ‘show’. The same meaning is transferred by a Türkic word kizik~kyzyk. In the first legend about an origin of Scythians Herodotus names as their primogenitors Targitai and his sons Lipoksai, Arpoksai and Kolaksai. As we have already seen above, these names are etymologized in Türkic more convincingly than in Iranian. The second legend about an origin of Scythians says that Heracleus, driving the bulls of Herion, came to uninhabited country. Here he run into bad weather and cold. Wrapped in a pork hide, he has fallen asleep, and at that time his horses disappeared. Waking up, Heracleus started to search for horses. In one cave he found a certain creature - half maiden, half snake. She told Heracleus that she had the horses, but she would not give them back until Heracleus makes love to her. They had born three sons. She named them Agathirs, Gelon, and younger Scyth. On advice of Heracleus, the mother arranged a competition between sons. Only Scyth could pull a bow of his father and put on his belt, therefore he remained in the country. From this Scyth, son of Heracleus, descended all Scythian kings [Herodotus. 1972. IV, 8, 9, 10]. Türkic j (dj) freely alternates with y, which in Greek is usually conveyed as g. Heracleus in Türkic Jirakl-Iirakl ‘earthly wit’; the clever wins all others, hence, he is a giant, hero. In Greek Heracleus is ‘famed hero, giant’. The first son of Heracleus is Agathirs, more correctly, Agathiros. Here -os is a Greek name ending; ir ‘man, male, people’; agad-agas-agach ‘tree, forrest ‘ (interdental d~th was written in Russian through Greek symbol theta and sounded as ‘f’: Theodor-Feodor, Skif-Scyth, Agathir-Agafir, etc.). Agathir is ‘forrest people or people with tree totem’. Later we meet this ethnonym in the forms akatsir-agach eri with the same meaning. In Türkic language with the same semantics we have also ethnonyms Burtas (burta-as ‘forrest people’), Misher (mish-er ‘forrest people’). The middle son of Heracleus is Gelon, in - Türkic jelon-jylan-yilan ‘snake’. This is a natural name of the son of the mother - half snake. The younger son of Heracleus is Scyth, more correctly, Skyth-Skyt. Scyth in Iranian is not deciphered. In Türkic the word skyth consist of ski-eski-iski and -t-ty-ly. Last affix is an affix of possession in Türkic languages; the first part eske ascends, apparently, to the word ishky, i.e. pychak ‘knife’. Isky-t, Isky-ly ‘with knife, man with knife’ [Zakiev M.Z., 1986, 35, 37, 38; Smirnova O.I., 1981, 249-255]. Remarkable fact is that Türks used the part eski (eske - ishky) as an independent ethnonym [Kononov A.N., 1958, 74]. Besides, it is necessary to keep in mind that the name of Scythians arises in Assyrian documents of the 7 c. BC as Asguza-Iskuza-Ishguza [Yelnitskiy L.A., 1977, 25]. Here appear clearly the ancient name of the Türkic tribes as-ash and guz-oguz (ak-guz). Skolot is a self-name of Scythians, its etymology could not be explained through the Iranian languages. In Türkic skolot consists of the part isky-sko, -lo is an affix of possession, -t is a second affix of possession. Skolo is skyty-skyt-skit, Skolot is ‘people mixed with Scythians’. Alongside with ethnonym Scyth Herodotus gives still another ethnonym Savromat, applied to the people related to Scythians. Later its changed form Sarmat begins to be applied instead of Scyth. Per Abaev, Savromat ~Sarmat is an Ossetian word with a meaning of ‘black armed or dark armed’ [Abaev V.I., 1949, 184]. To name one black armed, next should be others, for example, red armed or white armed. Therefore etymology of Abaev does not convince at all. In Türkic sarma ‘bags from calf fur with hair on outside’. A rope braided from the horsehair was pulled through the ears stitched to the top edge of such a bag and attached to the saddle. In it were transported bagged provisions [Khozyaistvo, 1979, 142]. Sarma-ty, Sarma-ly is ‘man with sarma’. Herodotus talks of Argrippeas, that they eat tree fruits. The name of the tree with fruits used for food is pontik. A ripe fruit is squeezed through a fabric, and the extracted black juice is called askhi. They lick juice and drink it mixed with milk. From the thick of askhi they prepare bread [Herodotus, 1972, IV, 23]. Many historians identify Argrippeas with Bashkirs. It is quite probable, as the Bashkirs when meeting Greeks could introduce themselves with pride as irat ‘real men’, in their attempt to translate it to Greek translated only the second part - at (horse in Türkic) - gippei. So could appear the word Argrippei. In this message there are words pontik and askhi, which can be etymologized as pontik - bun-tek - bunlyk, where Old Türkic word bun is ‘soup, broth’, and pontik means ingredients for soup; and as askhi-asgy, i.e. suitable for food (as-ash ‘food’). The Türks today are in fact making from the askhi dried pulp a pastille. The etymology of the Scythian word Kaukas (Caucasus) is interesting. The first part - kau - in Türkic means ‘gray-yellow-white’, it is used in ethnonym kyuchak~kyfchak~kypchak ~kyu~kiji etc. ; kyu swan ‘swan’. The fact that in the word Caucasus kau-kyu expresses the meaning of ‘whiteness’ is proved by another Scythian name of Caucasus - Kroukas. Pliny Segund (1 c. AD) writes that Scythians call the Caucasian mountains by the name Kroukas, i.e. ‘white from snows’ [Latyshev V.V., 1896, Vol. 1, Issue. 2, 185]. In Türkic kyrau is ‘frost, frozen dew, snow’. The second part of words Caucas and Kroukas is -kas, it means ‘rock, rocky mountain’. Compare: in the Altai language kaskak ‘steep slope’, common Altaic kad~kaz ‘bluff, cliff’. An interesting Scytho-Türkish material is present in the Scythian mythological words. Gestia - the Goddess of the home hearth - in Scythian is Tabiti, apparently, from word tabu ‘find, swindle’. Zeus - the Supreme God, king and father of the gods and people - in Scythian is Papei, in Türkic babai ‘primogenitor’. Geia - impersonation of the Earth, she gave birth to Uranium (sky), Mountains, Pont (Sea); Geia in Scythian - Api, in Türkic Ebi ‘primogenitor mother’ [Zakiev M.Z., 1986, 27]. The Scytho-Türkic etymologies given above show that among Scythians, certainly, were Türkic tribes. Therefore the opinion codified in the (Russian - Translator’s note) official historical science that there is only one Scythian language, that it is solely of the Iranian group, that allegedly the first Türks came to Europe only in the 4 c. AD under an ethnonym of Huns, that there was Türkization of Volga and Urals population that began only in the 4th or 7th century AD - all this, naturally, does not correspond to the reality. § 5. A general view of the historians on ancient Türks. In the postulates of the (Russian - Translator’s note) official historical science, the Türkic tribes are considered rather young, diverging only 6-8 thousand years ago from the Türkic -Mongolian genus. And in the world historical science they find a place only from the 4-3 centuries BC, as Huns of Central Asia. In this sad state of affairs are guilty first of all the Türkologists, who until today have no scientific forces for the detailed study of the ancient Türks. Even the not too wealthy data available on Huns is found not by the Türkologists [Gumilev L.P., 1960], and therefore it is no wonder that the Mongolian scientists have begun to identify Huns with Mongolian tribes [Sukhbaatar G., 1976]. In the 19-century scientists found that the languages of the American Indians have many lexical units with the semantic system reminiscent of Türkic words. In the 20 c. these similarities were established for many parameters, and the scientists made a conclusion that in the languages of American Indians the traces of the Türkic languages were preserved very clearly [Zakiev M.Z., 1977, 32-35]. If to note that these Indians came from Asia to America 20- 30 thousand years ago and had no links with Türks any more, the presence of the traces of the formed Türkic language in the Indian languages, left by the Türks 20-30 thousand of years ago, shall be recognized. The bright and uncontestable traces of Türkic language are preserved in the cuneiform texts of Sumerians, who lived in the Mesopotamia between Euphrates and Tigris 6 thousand years ago [Suleimenov O., 1975, 192-291; Zakiev M.Z., 1977, 36]. Zaki Validi Togan in his works, written in 20-es of the 20 c., was the first in Türkology to state an opinion that bright traces of Türks were kept in the languages of American Indians, Sumerians, and Elamites [Validi Z., 1981, 10-17]. Per the Assyrian and other Eastern ancient written sources the name Udy (Kuty) is traced from a deep antiquity, namely from the 3-rd millennium BC, they can be connected with Caspian Udy, later Udyns, Bodins, Budins [Yelnitskiy L.A., 1977, 4]. We believe that Udy is later Uzy (Türks), more so because the sounds d-z in various Türkic dialects easily replace each other. The Indian and Chinese written sources of the turn between 2-nd and 1-st millenniums BC give the tribal names of the Eastern Asian nomads: Dai, Se (Ti), and Unu etc. Later they can be found among Cimmerians and Scythians, and some of them as Sai, Dai, Huns, Unns, are recorded in the most Western part of Eurasia, down to borders of Northern Italy [Yelnitskiy L.A., 1977, 4]. So and Huns are famed Türkic tribes. Consequently, long before our era the Türks lived in both Europe and Asia, and they, naturally, were both among Cimmerians, and among Scythians-Sarmatians. There is a justified opinion of the scientists that Etruscans who lived in the 1-st millennium BC in the North Western part of Apennine peninsula and who created an advanced Pre-Roman civilization were also Türkic in their origin. The genetic ancestry of Etruscan language in the (Russian - Translator’s note) official historical science has not been established yet, but there are detailed studies, including by a Türkish scientist - a daughter of Sadri Maksudi Adilya Aida, proving a Türkic character of Etruscan inscriptions [Adilya Aida, 1992, 390]. Thus, Türks formed 20-30 thousand years ago and lived in different regions of Eurasia under various ethnonyms. Ethnonym Türk by itself is known in history only from the 5-8 c. AD, prior to that it was an ordinary cognomen alongside with other Türkic ethnonyms. Scientists begun to apply it as a common name to designate all Türkic peoples only since the 19-20 centuries. The historians living in time much closer to Scythians and Sarmatians quite often identified them with Türkic tribes. At the same time in no case they identified Scythians and Sarmatians with Iranian-lingual tribes. So, Philostogori (4 c. AD) has noted, that ‘these Unns are probably those people, who ancients called Nevrs’, i.e. Scythians [Latyshev V.V., 1900, 741]. Theophan the Byzantian (5 c.) renders Huns as Scythians. He writes: ‘Meanwhile Scyth Attila, son of Omnudiy, brave and proud man, removed his senior brother Vdela, assumed sole authority over Scythians, which also are named Unns, and attacked Thracia’ [Theophan the Byzantian, 1884, 81]. On the other side, he depicts Türks as Massagets: ‘East from Tanaid live Türks, in antiquity called Massagets. Persians in their language call them Kermikhions’ [Byzantian Historians. SPb., 1861, 492]. In this record of Theophan deserves an attention the fact that he knew well both Massagets (one of the Scythian tribes), and Persians. If Scythians-Massagets spoke Persian, he would inevitably note this detail. But Theophan identifies Massagets with Türks, not the Persians. In the second half of the 5 c. Zosim expressed some confidence that Unns are Royal Scythians [Latyshev V.V., 1890, 800]. In the 6 c. Menandr Byzantian writes, ‘Türks, in antiquity called Sakas, sent to Justinian an embassy with peace offers’ [Byzantian Historians. SPb., 1861, 375], and about Scythian language he says ‘Türkic barbarous language’ [Ibis, 376]. In other place Menandr Byzantian writes: ‘...So all the Scythians from the tribes of the so-called Türks gathered up to a hundred six men’ [Ibis, 417]. Procopii Caesarian (6 c.) one of Scythian tribes - Amazons - identifies with Huns and Sabirs [Procopii Caesarian, 1950, 381]. Also he under Cimmerians means Türks-Huns, Utigurs, Kutrigurs ‘This swamp flows into Euxine Pont. The peoples, who live there, in antiquity were called Cimmerians, now they are called Utigurs’ [Procopii Caesarian, 1950, 384-385]. Theophilact Simocatta (7 c.) also marks that eastern Scythians usually are called Türks: ‘Expelled from the empire, he (Khosrov) left Ktesifon and, crossing river Tigris, hesitated, not knowing what to do, since some advised him to go to Eastern Scythians, which we habitually call Türks, others advised to go to Caucasus or Atropine mountains and to be saving his life there’ [Simocatta Th., 1957, 106]. The message in the ‘Rus Primary Chronicle’ (12 c.) also deserves an attention, that Scythians, Khazars and Bolgars are the same people: ‘When the Slavs, as we already spoke, lived in Danube area, came from Scythians, i.e. Khazars, so-called Bolgars and stayed on Danube’ [Rus Primary Chronicle, 28]. We have seen above that in the initial Russian history the Scythians and Sarmatians were considered to be Türks, for example, A.Lyzlov, V.N.Tatischev etc. This view had at first the Western historians also. So, the English historian of the 19 c. V.Mitford in the ‘Histories of Greece’ writes: ‘There are places in the world where inhabitants differ strongly from other people in customs and lifestyle. Among them it is worth to note those called Scythians by the Greeks, and by the contemporaries - Tatars’ [Mitford V., 1838, 419]. Here it is necessary to note that in the West then under the name Tatars were understood almost all Eastern peoples, but the Moslem Türks were nevertheless considered as real Tatars. In the middle of the 19 c. the Russian historians and geographers were convinced that Scythians were Türkic speaking. So, R. Latama wrote in 1854 in the Bulletin of Russian geographical society: ‘The Türkic origin of the Scythians now days... does not require any special proofs’ [Latama R., 1854, 45]. Thus, there were scientists, who considered Scythians as solely Türkic speaking, i.e. they created Scytho-Türkic theory, whereas others adhered to the Scytho-Iranian theory. In our opinion, neither is adequate. Cimmerians, Scythians, Sarmatians, certainly, were polyethnical, among them were ancestors of those peoples, who occupy now the so-called ancient Scythian territory - Eastern Europe, Siberia (except for Far East), Kazakhstan, Central Asia, Middle and Near East. Among all peoples of this extensive region the Türks have a significant place. This important factor, and that Scythian ethnological, mythological and linguistic traces were mostly preserved among Türkic peoples, incontestably proves that among ancient Cimmerians, Scythians and Sarmatians were many more Türks than ancestors of the Slavs, Finno-Ugrians, and even Iranian-lingual Ossetians (if the last belonged to Scythians at all). § 6. Which ancient peoples of Eurasia were Türkic speaking? The (Russian - Translator’s note) official historical science asserts that first Türks came to Europe only in the 4 c. AD under a name of Huns, and in Asia BCE they were known only as Huns . If the Türkic language existed 20-30 thousand years ago (considering its traces in the languages of American Indians), there are no reasons to think that they lived somewhere outside of Eurasia. Therefore it is surely reasonable to look for Türks among the first Chinese, Indian, Assyrian, and Greek written sources. In North Iranian, Caspian, and Caucasus ethnonymy and toponymy, and also per Assyrian and other ancient Eastern written sources as far back as the 3 millennium BC there were known people Udy, which correspond to Caspian Udy, later Udyns, Bodins, Budins [Yelnitskiy L.A., 1977, 4]. The Indian and Chinese sources of the turn between 2-nd and 1-st millenniums BC give the tribal names Dai, Se (Ti), Unu, names found among Scythians as Sai, Dai, Huns, their territories extend to the borders of northern Italy [Yelnitskiy L.A., 1977, 4]. In the post-Scythian period these tribes are found as Uzes-Guzes, So, As, Unnu-Gun-Sen.
Tochars are Türkic people, who lived in the 3-2 millennium BC in Eastern Europe, not later than the middle of the 1-st millennium BC they lived in Central Asia [BSE, Vol. 26, 126]. In the 2 c. AD Ptolemy still places Tagars (Tochars) in Western Europe, near Dacia [LatyshevV.V., 1893, 232]. It is interesting to note that German Indo-Europeists bestowed the ancient Tochars with a unique Iranian language. At the end of the 19 and the beginning of the 20-century in oases of Xinjiang (‘New Territory’ in Chinese, Eastern Türkestan is called by the today’s Chinese Xinjiang - 'New Territory'- Translator’s note) were found monuments with writing in a distinct Western-Iranian dialect. When checking a text translated from Sanskrit to Uygur, a German Türkologist found that the text was translated to Uygur not directly from Sanskrit, but through Tochri. Based on this message the other German scientists named the Iranian texts ‘Tocharian’. ‘ They connected the Uygur word ‘Tochri’ with the name of ‘Tocharian’ people, who, on the evidence of the ancients, lived in Bactria.. The name ‘Tocharian language’ survived until now, despite of the vigorous protests of many scientists’ [Krauze V., 1959, 41, 44]. Here the breach of logic jumps into the eyes at once: the Uygur text did not say that Tochri spoke an Iranian, most likely they were Türks, if Uygurs used their language. Besides, we know that Tochars in Central Asia in antiquity were closely connected with Saka-Massagets, which in the 5-7 centuries are known as Türkic people among Ephtalites-Türks and Türks. Mahmud Kashgari also regards Tagars (Tochars) as Türks. The root of the word "Tocharistan" endured in topo- and ethnonymy, connected with Uzbeks and Kazakhs’ [Tolstova L.S., 1978, 10]. Tochars took an active part in the formation of the Uzbeks. Such people as Tochars, very broadly widespread (from Eastern Europe to Central Asia), cannot undergo Türkization so quickly, and, most likely, Tochars were Türks from the very beginning. And from the standpoint of etymology the ethnonym Tochar (tokh~tog~thag ‘mountain, tree, forest’, ar ‘people, man’, Tochar ‘mountain and forest people’), Tochars should be classical Türks, which does not exclude other tribes among them, for example, ancient Iranian-lingual tribes. Ethnonymically close to Tochars are biblical Togars (Togarma) and Scythian Tavrs. In the Bible (in the Genesis) story, son of Yaphet, Homer had three sons: Askenaz, Rithat and Dogarma (Ch. 10). This Bible chapter was written well before our era. Later, Dogarma~Togarma becomes a usual ethnonym for Türks in Old Hebrew language. Khazars, who accepted Judaism, were also called Togarma. The part Togar-Tochar is clearly visible in this ethnonym, meaning ‘mountain or forest people’; -ma, maybe, is an interrogative particle, compare: sin Togarmo? ‘Are you Togar?’; or a truncated indicator of the adjective affix of the 1-st person singular: Togarmyn - Togarmy ‘I am Togar’. The fact that the Jews gave Türks an ethnonym Togarma way before our era tells about the presence of Türks in Europe from the most ancient times. Tavr is the other dialectal pronunciation of the same ethnonym Togar-Tochar: tav-tau ‘mountain, forrest, tree ‘, er ‘people, man’, Tauer-Tavr ‘forrest or mountain people’. We know them well among Cimmerians and Scythians: they lived in Tavria. Herodotus regards this territory as Scythian native, a mountainous country, which begins from the mouth of Ister (Danube) and reaches up to the Kerch strait [Herodotus, 1972, IV, 99]. Stravon calls the Crimean peninsula Tavrian and Scythian [Latyshev V.V., 1890, 122]. Eustaphy (12 c. AD) writes, that ‘the tribe of Tavrs received its name, reportedly, from the animal ox’ [Ibis, 195]. From the standpoint of Türkic language the name of an animal ox, Tavr, most likely came from tuar (tal-tuar) ‘an animal’, or ox was brought to Greece from Tavria, and therefore was referred to as Tavr. The Tavrs were members of the Scythian confederation. When Scythians had to fight the advance of Darius army, the peoples of confederation called a meeting, which included ‘kings of Tavrs, Agathirs (Agathir-Agacher - M.Z. ), Nevrs, Androthags, Melanchlens, Gelons, Budins and Sauromats’ [Herodotus, 1972, IV, 102]. If these tribes were Iranian-lingual, they would not battle with Iranian-lingual army of Darius, and Darius would not pursue his kinfolk that shared Iranian deity and language. There is a reason to deem that among the listed Scythians everyone was Türkic speaking. Before proceeding to the description of the Scythian people, here are a few words about Sogdians, proclaimed by Indo-Europeists as Iranian-lingual. The Indo-Europeist scientists attribute a some Indo-European language to almost all peoples whose names are known from the sources, but whose languages are not described. So, ‘one of the literary languages, in which the documents and fragments of works of the religious literature were found at archeological explorations in Central Asia, was named Sogdian’ [Bartold V.V., 1964, Vol. 2, Part 2, 461]. In the Chinese history Sogdians are regarded as Türks. In their origin they are closely associated with Sakas, who we also deem as Türkic speaking. Later Sogdians became Uzbeks, and in the opinion of Indo-Europeanist historians, they also became Tadjiks. M. Kashgari classifies the Sogdak people as Türks. And the etymological ethnonym sounds Türkic: -dak~dyk~lyk is a Türkic adjective affix; Sag ‘health, wit’, Sog ‘milking’, Su ‘water’, Sogdak ‘healthy, clean, milker - milking, or ‘ healthy, or water, river people’. Chinese historians identified Sogdians with Aorses (aor-auar-avar) or Alans, whose Türkic language is noted by the ancient authors themselves. V.V.Bartold, traditionally considering Aorses and Alans as Iranian-lingual, writes: ‘Chinese at that time knew a name Suy or Sude for the country of Aorses or Alans, which, in the opinion of the late Sinologist Khirt, was a word Sogdak or Sugdak. Türks called so the area and Sogdian people in Zeravshan’ [Bartold V.V., 1964, Vol. 2, Part 1, 550]. V.V.Bartold is inclined to reason that allegedly Sogdian language of the Iranian type has turned into Türkic [Bartold V.V., 1964, Vol. 2, Part 2, 467]. We know that languages do not alter into other languages. Therefore it is more reasonable to admit that Sogdians (Sogdak) were Türkic speaking from the beginning. The Kushans created in the 1-2 c. AD a Kushan empire in Central Asia, Afghanistan, Pakistan, Northern India and Eastern Türkestan (called by the today’s Chinese the ‘New Territory’ Xinjiang - Edit). They are also consigned as Iranian-lingual, but the fact that at the same time many historians identify Kushans with Ephtalites-Türks [Procopius Caesarian, 1876. The comment of G.Destunis, 60] and that they later transformed into Türkic people tells about Türkic speaking of Kushans. But, unfortunately, Kushans are very poorly studied, and their ethnic accessory is not affirmed. Let us proceed now to Scytho-Türkic people. First of all it is important to say about so-called Agathirs. As this was already said in the 4-th paragraph, this ethnonym in Türkic means ‘forest people or people with tree totem’. Later this ethnonym is met as Acatsir (Acats ‘tree, wood’) and Agach Eri with the same meaning. Acatsir were in closest relationship with Frakians (Rus. spelling - Translator’s note), more correctly pronounced Thracians, i.e. Thracs. The Indo-Europeists traditionally strapped an Indo-European type language for the Thracs (Thracians). Therefore it is impossible to recognize as a correct opinion that they spoke one of the Indo-European languages, they also were not studied from the standpoint of Türkic languages [Budagov B.A., Geibullaev G.A., 1988, 126]. We already discussed Gelons, Tavrs and Budins (Ud-Uz) as Türkic speaking tribes; Philastorgiy identifies Nevrs with Huns. Herodotus also knew, in the Scythian times, the former ethnonym of Kangars (Rus. Pechenegs). Herodotus wrote: ‘This horse mail the Persians call angareion’ [Herodotus, 1972, VIII, 98]. This word comes from Türkic ethnonym Khangar-Kangar. Among Persians Kangars served as the couriers, and consequently in the Persian language ‘courier’ was linked with the word khangar. Among Sarmatians in the end of the 1 c. BC are Aorses, ethnonym of which ascends to Auar-Avar with the Greek ending -s, -os. Later, Auars-Avars are a known Türkic ethnos. About Alans-Ases it is possible to say the following. They are considered Iranian-lingual by mistake or based on a tradition of recognizing all Scythians and Sarmatians as Iranian-lingual. As recognized by their contemporaries, and by their traces, and also based on the ethnonymy Alans-Ases should be recognized as Türkic speaking people [Zakiev M.Z., 1986, 40-43; Laipanov K.T., Miziev I.M., 1993, 97-113; Miziev I.M. 1986, 78-94; see also below ‘Alans: Who are they?’]. Naturally, the hypotheses about Türkic people among Scythians and Sarmatians require additional thorough researches. But already now it is possible to tell with confidence that Türks among Scytho-Sarmatians occupied a significant place. Summarizing, it is possible to tell with confidence that in Europe and in Asia the Türkic people lived from the most ancient times. Opinion about the beginning of Türkization of Eastern Europe, Volga and Urals only from the 4 c. with the arrival of the first Türks-Huns from Asia, is incorrect and fantastic. If in the 4 c. there was a mass movement of peoples from the periphery of the Roman empire to its center, it was not a great resettlement, but a liberation movement, in which Huns were actively participating. § 7. Ethnic components and ethnolinguistic continuity of development of the Tatar people in the Middle Volga and Urals. Türkic language of Middle Volga and Urals region (i.e. Volga-Kama region) was formed by consolidation of various, first of all, of Türkic speaking, but partly also of Türkisized Finno-Ugrian speaking components. As with other peoples, for external relations it carried the ethnonym of the dominant component. Today one, tomorrow another group dominated this region, and therefore in different periods of history the Türkic speaking people of Volga-Kama region carried various common ethnonyms. The first Türkic ethnonym of this region reaching us was Biar (versions: Biger, Biler, Buler), the root of which is bi ‘rich, owner, hero’; the second part ar is from a word er ‘people, males’, Biar is ‘rich people, owners’. Biler (local pronunciation Buler) is formed from the same word Bi, but with a plural ending. Variations of the word bi is bik-bek, from this root came ethnonym Biger (Bik-er), with which our ancient Udmurt neighbors, following ancient tradition, still call Tatars. We meet in Herodotus an ethnonym of the same meaning, but in different Türkic phonetic shell. Next to Argippeans (Ar-gippei is Türkic ir-at, the part at is translated by Herodotus to Greek by the word gippei) it marks Iyrks, ethnonym of which consists from iyi~iye, that corresponds to the word bi: iyi~iye ‘owner, good, rich’, erk ‘man, male’. The scientists have established that Argippeans (irat) are the ancestors of Bashkirs, and iyrks are ancestors of Biars (Bilyars). So, the Türkic speaking tribes - ‘rich owners’ (Iyrk, Biar, Biler, Biger) already lived in the Volga-Kama region in the 9-8 c. BC. And their ethnonym in the form Biger has reached our days as one of the Tatar names, and in the form Biar it was the name of the historically known state Biarm (mine Biar), in Russian - Biarmia, in European - Biarmlanda. It is probable that among Biars already dwelt Türkic tribes Kipchaks, whose ethnonym means ‘fair faced, fair haired’ (kyu-kyf-kyp ‘white, yellow - white’, chak ‘exact, just’; Kipchak ‘Whites’; Chak~Sak can be an ethnonym of one of Türkic tribes: Kyp - Sak ‘White Saks’). The Slavs translated this ethnonym in their language and instead of ethnonym Kipchak applied a word Polovets, from an adjective polovyi ‘pale yellow’. As writes Ibn Fadlan, when the embassy of the Ruler of the Faithful Al Muktadir arrived to Bulgars, a more common ethnonym of these people in Arabic was Sakaliba ‘fair, pale yellow’. Hence, Kipchaks then understood well the meaning of this ethnonym and have translated this meaning to Arabs (as they translated it to Slavs), from this meaning ‘fair faced’ the visiting Arabs formed Arabic ethnonym Sakaliba. Therefore it is possible to assert that the translation in the historical literature of the Arabic word Sakaliba as Slavs does not withstand criticism neither from the standpoint of ethnonymy, nor from a standpoint of mutual relations between tribes: if Sakaliba were Slavs, the Bulgars among the Slavs could not remain Türkic speaking. One of most ancient Türkic ethnonyms was a word As-Az-Oz-Uz~Ud, met in the Assyrian sources as the name of tribes living in the 3-rd millennium BC. We know, that Bulgars in another way were called Ases (the wife of Anrey Bogolubsky, a Bulgar, was called ‘Yass princess’). Next to Bulgars-As lived tribes Su-As ‘river As’. Mari, the ancient neighbors of Tatars, until now traditionally call Tatars by the ethnonym Suas, and call the modern Chuvash (historical Veda) - Suaslamari. The ancestors of Perm Tatars carried an ethnonym Ostyak, which was formed from Os-As and an affix -lyk-tyk-tak; ostyak~ostyk ‘weighty’. As was established by the scientists, the other name for Ases was Alan. As relayed by ancient authors, Alans spoke Türkic-Kangar language, the ethnonymic data also supports that they were Türkic speaking [Zakiev M.Z., 1986, 41; Miziev I.M., 1990, 73-96; Laipanov K.T., Miziev I.M., 1993, 97-113]. But, trusting the statements of Indo-Europeists about exclusively Iranian linguality of Alans, the Hungarian scientist Yu.Nemet, having found an Iranian-Ossetian text in Hungary, attributed it to the local Alans. Thus appeared an ‘incontestable proof’ of Ossetian linguality of Alans, who in all other attributes are close to the Hungarian Kuns, i.e. Kumans-Kipchaks [Nemet Yu., 1959, I960]. On the ethnotoponymy data in the component mix of the Tatar people also joined ancient Kangars, who later (in Russian. - Edit.) were referred to as Pechenegs. The ethnonym Khangar was known in the time of Herodotus, i.e. in 6-5 c. BC, now as Kungur it is known as the name of the city in the Perm area. There is also a city of Osa, which name comes from the ethnonym Os~As. This opinion is supported, in addition, by the fact that the former ethnonym of Tatars, who were living in the vicinity of this city, was Ostyak, i.e. Os-tyk~Os-lyk, meaning ‘of Oss, Ossian’. In the formation of the ancestors of Tatars also took part Huns, i.e. tribes Sen in the Tatar pronunciation, this word Bashkirs pronounce as Hen, from it come both Hun and Gunn. About it tells the presence of ethnohydronym Sen in the territory of Tatarstan . Thus, the ancestors of Tatars of Volga and Urals were formed by a long consolidation of various ancient Türkic tribes, some Chuvashes - former Veda, naturally, entered the mix, Türkicized Maris, Mordvas and Udmurts also joined in. But ethnolinguistic customs of the Volga - Kama region developed long before our era, and the ancestors of Tatars never lost these basic traditions, i.e. in this region a developing ethnolinguistic continuity existed from the most ancient times until now. Linguists have determined that an original language union formed in the Middle Volga and Urals area from the Türkic ancestors of the Tatar, Bashkir and Chuvash languages, and from the Finno-Ugrian ancestors of the Mari, Udmurtian and Mordovian languages [Serebrennikov B.A., 1972; Zakiev M.Z., 1987, 176 - 182]. It means that specific features of some languages gradually penetrated into others in a long mutual influence. As a result the Türkic language of the Volga and Urals region under the impact of local Finno-Ugrian languages received some lexical, phonetical and grammatical features that distinguish it from the Türkic languages of other regions. Precisely as well the Finno-Ugrian languages of this region under the influence of the local Türkic languages received such features that distinguish them from Finno-Ugrian languages of other regions. Hence, the Türkic language of the Volga - Kama region (i.e. the language of the ancestors of Tatars, Bashkirs and Chuvashes) was formed in this region with colloquial features, versus of being introduced from other regions, for example, from Near East, from Middle East or from Central Asia etc. If to appraise that mutual influence of different groups of languages at the phonetics and grammar level gives appreciable results only after millenniums of contacts, it is compelling to recognize that the Volga - Kama language union of the Türkic and Finno-Ugrian languages was formed in the deep antiquity in the Scythian or pre-Scythian times. Since then remained the ethnolinguistic continuity in the development of the Tatar people in the Volga-Kama region , referred to differently in different time, because different tribes were leading in different times. To state it in other words, the ethnolinguistic structure of the Tatar people remained stable, despite of the repeated changes of the ethnonyms, though at different times it accepted in its fold a part of the new coming tribes, and assimilated among local Türks: at first the Common Türkic-speaking Bulgars, and then Tatars with Central Asiatic attributes of the language. The Hungarians, 1987. - Hungarians in East Europe // Archeology of USSR. Finno-Ugrians and Balts in epoch of Middle Ages. M., 1987. Latyshev V.V. News of the Greek and Latin ancient writers about Scythia and Caucasus. Serebrennikov B.A. About some distinctive attributes of Volga - Kama language union // Language contacts in Bashkiria: Scientific Notes of Bashk GU. Philological Sciences Series. Ufa, 1972. Issue 50.